Sorry, this post isn't talking about your toothless Great Uncle Gerald. No, the old and scary featured are vintage frights, perfect for your Halloween festivities. Or anytime, if you happen to be a weirdo. What better way to terrorize those you love than with a ghastly disguise? Check out the mask menagerie below and be inspired for classic ways to haunt and taunt. Nothing says, "Hands off my stapler," better than an eco-friendly tribal relic. Keep it in your cubicle and be ready to OOGA BOOGA at will. Free voodoo curse available with purchase. There are times when a polite greeting and social small talk can be comfort on a long flight. 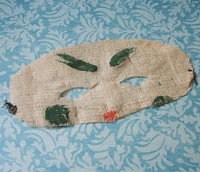 For the remaining 90% of air travel, allow me to present this vintage 40's era handpainted gauze mask, an affordable option for guys and gals on the go. Light and portable, it will breeze past security without adding extra weight to your carry-on. Once comfortably seated, secure mask firmly on face and assume nap position. Remain silent for the duration of the flight, and thank me for helping you enjoy a pleasant flight. Face it, you can't help being irresistible. Too bad those charms are so powerful - there's no way to zero in on just one sweetie! What to do when Creepy Carl or Desperate Donna manage to weave into your web? It's hard to shake those clingy catches without a fail-proof plan. 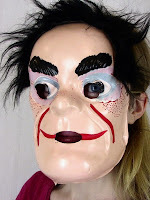 Why not send a clear message with this 1970's-era Gargamel/Fred Flintstone/Psychobilly Mask? After all, this is no time to be subtle. You'll quickly quell any romantic interest, saving valuable time that could be spent playing Casanova to other cuties. It's not that you dislike children, really. It's just your friend Rhonda has decided to be fruitful and multiply for the fifth time and you kinda enjoy your weeknights whine-and-booger-free. Don't clown around! Take a stance for your free time. Next time someone tries to sucker you into pro bono babysitting, tell them you've taken an interest in carnival living. 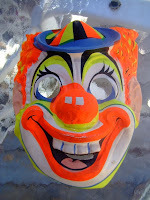 Wearing this mask insures no one (with legal custody or visitation rights) will trust you to watch their little angels. It's a shame we don't celebrate Halloween here. Wouldn't it be more fun for me to pull on one of these masks right when people are least expecting it, rather than on Halloween when they probably would be expecting it.